The journey that I am about to tell you about was not a thousand miles long, although at times it seemed like it. And I suppose a single step was involved, but even that happened after some planes, trains, and automobiles. But I'll get to all that later. The patch on my pack looked pretty clean at the start. For the moment recognize that our experience of the Camino de Santiago started in France. After landing at the Aéroport de Paris-Charles-de-Gaulle, Bob, my son-in-law, and I took the train into the city. There were several landmarks on our to-do-list, one being the Tower of Saint James. If you look closely at the banner image draped at the top of this story, you can see it looming large and blocky on the left. It overlooks the Seine as viewed from one of many picturesque bridges of downtown Paris. Such places are wondrous to those with selfie sticks (and recognize that there are sticks aplenty in Paris). The tower is impressive. Its architecture is pure gothic in style, with all the ribs and nubbins favored by pigeons. It rises 203 feet from the base to the noggin of Saint James who teeters on top. Along the way a magnificent belfry may be found. Each of its four sides measures 30 feet and nine inches. The tower is the only fragment remaining of a church (remembered as Église Saint-Jacques-de-la-Boucherie) that was already standing here in the 12th century. Orators like Jean-Pierre Camus and Jacques-Bénigne Bossuet preached from this structure. Hidden ruins are older still; the church may have been founded by none other than Charlemagne the Great One in the 8th century. The tower is impressive. A statue of Blaise Pascal stands at the base. He reminds us that gravity is a splendid thing. Sadly the church was abolished during the French Revolution and dismantled stone by stone. The tower remained, albeit in a shoddy state. It assumed a new life as a the center of a thrift shop and shot factory. Apparently molten lead could be dropped from this height and would cool into shot by the time it hit the ground. This was undoubtedly unsettling to the thrifty shoppers below who were just out looking for Cabbage Patch collectibles. Our interest in the structure stems from its association with Saint James. His statue dominates; others dangle below. The tower is located along a medieval pilgrimage route known as the Via Turonensis (or the "Way of Tours" after a city in Western France). At one time it was incorporated into a church that contained the relics of the martyr (which specific parts no one seems to know) and served as a pilgrim site by its own power. The routes across France are shown in blue. The primary route across Spain is shown in red. Remember everything moves west. There are four major routes or "streams" across France that feed the Camino de Santiago. Recognize that the site labeled here as Compostela is the same as Santiago de Compostela or simply Santiago. Image from here, accessed 6/27/2018. The first of the four routes across France is the Via Turonesis or the "Way of Tours." This is the most westerly of the four ways and the one that served pilgrims from the Low Countries. It is a flat course that originated in Paris and passed under the shadow of our Tower of Saint James. The second, third, and fourth routes are identified as the Via Lemovicensis, the Via Podiensis, and the Via Tolosana respectively. All four of these routes converged near the French/Spanish border (Puente la Reina in Spain, to be exact; I celebrated the moment as a POTD here and here). From that convergence all streams rolled west as a single river known as the Camino Francés. Our first touch with the Camino. Bob and I symbolically put our fingers on the Saint-Jacques Tower in Paris. The effort did not represent the starting point of our walk, but our first touch with it. From this iconic tower our engagement with the Camino began. Blaise photobombs a pair of gringos. *Or if you prefer a more original, 千里之行，始於足下. See Lao Tzu in Tao Te Ching, 64. **The idea of four routes that become one goes back to Codex Calixtinus, a 12th century illustrated manuscript. For an English translation of the piece relevant to this discussion, see here. Note our own comments on the Calixtinus posted here. ***There is actually a pretty good chance that "gringo" is some sort of vulgar morph of the original (pere)gringo or peregrine. If this is the case, I will wear the title gladly. Follow the footnotes here. Join Mark and Vicki for a Mediterranean experience in October, 2018. We'll be cruising aboard the luxurious Celebrity Reflection. See the link here for details. Onboard lectures will provide focus for the group as we visit the ports of Malta, Rhodes, Santorini, and Athens among others. 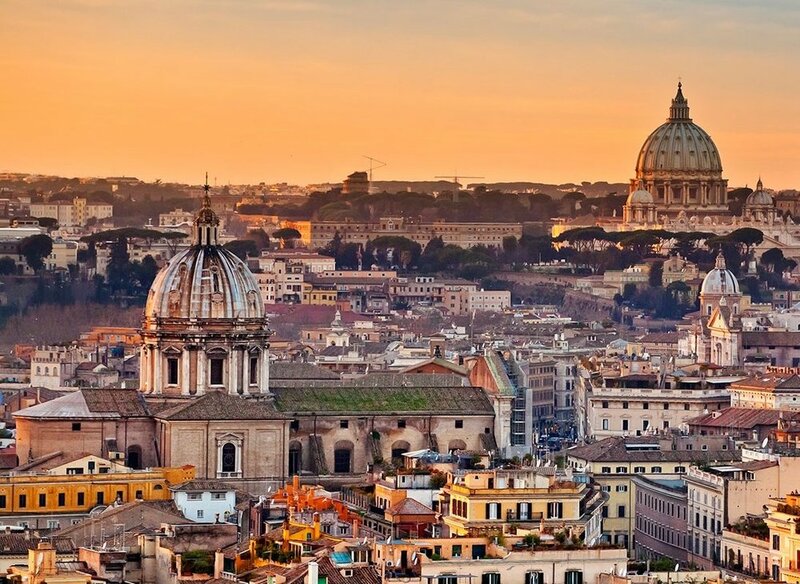 An optional add-on visit to Rome is possible on either end of the trip.